With roots in both Venezuela and L.A., Devendra Banhart has been making highly singular music for a long time. Over the decades, he has shown us that he is an eclectic artist capable of both reinvention as well as subtly refining his craft. 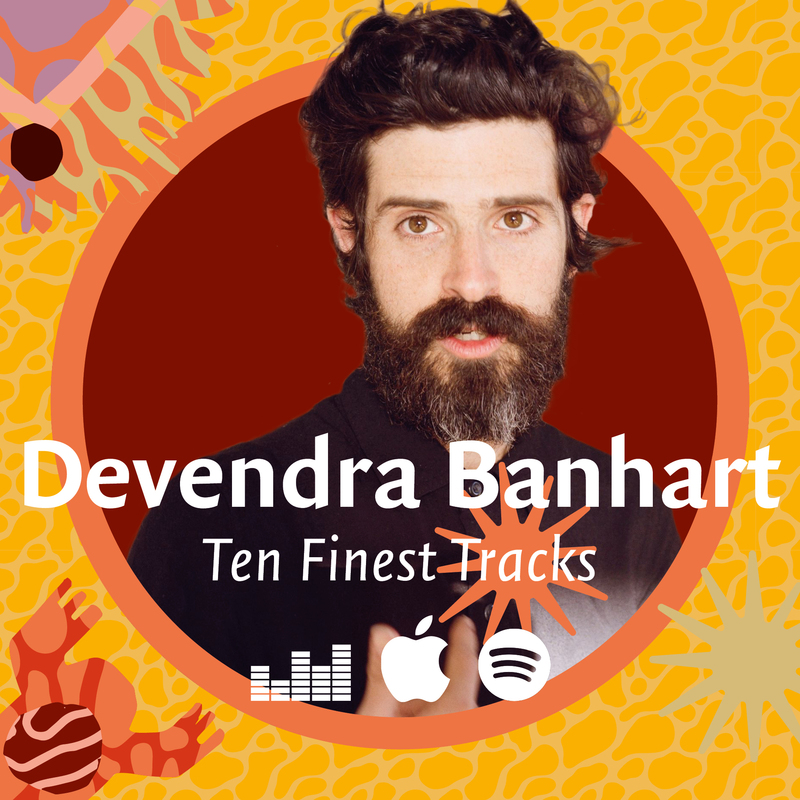 In this playlist, we pick ten of Devendra's finest tracks, while at the same time, try to show you how Devendra's sound has developed over the years, starting from his folky beginnings down a meandering path towards the eclectic and dreamy quirkiness of his newer records. Banhart got his start on Michael Gira's label Young God Records. The warming folk on the records he made for Young God revealed an ear for unorthodox hooks and peculiar, unpredictable songs. This style provided a springboard for Banhart's artistic work and remained a consistent factor throughout the rest of Devendra’s output in later years. His next few albums, released on XL recordings, show a great talent and sensitivity for the creation of vivid lyrical worlds, which at points seem more akin to comedic sketches. This can especially be heard on 'Shabop Shalom' which, like many of his songs, create a fully fleshed out world in only four or five minutes, with a total lack of pretension and a great sense of humor. When Banhart moved to other labels, he started developing his sound in a different way. Incorporating a vast assortment of instruments, but also drawing from sources of musical inspiration from all over the world, his music soaked up all these new elements like a sponge. This new sound retained his trademark humor and wit, but additionally, this work feels more gracious, smooth and funky. This is best exemplified by 'Fig in Leather' and 'Für Hildegard von Bingen'. With new work on the way, we found it a fitting time to invite Devendra Banhart to curate his very own program at Le Guess Who?, to present the variety of his interests and influences, as well as several artists he has collaborated with over the years. His curated program at Le Guess Who? will feature a.o. Vashti Bunyan, Ebo Taylor, Joan of Arc, Beverly Glenn-Copeland, Rodrigo Amarante, Shannon Lay, Jessica Pratt, Shintaro Sakamoto, SASAMI, and many more.